This article is about the still-running or defunct amusement parks of this name. For other uses, see Luna Park (disambiguation). The "Electric Tower", centerpiece of the original Luna Park on Coney Island, ca. 1905. 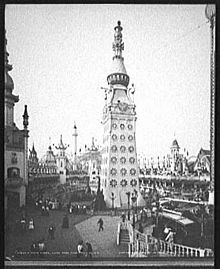 Many subsequent amusement parks that took the name "Luna Park" had their own central towers. Luna Park is a name shared by dozens of currently operating and defunct amusement parks. They are named after, and partly based on, the first Luna Park, which opened in 1903 during the heyday of large Coney Island, New York parks. The original Luna Park on Coney Island, a massive spectacle of rides, ornate towers and cupolas covered in 250,000 electric lights, was opened in 1903 by the showmen and entrepreneurs Frederic Thompson and Elmer "Skip" Dundy. The park was either named after the fanciful airship Luna, part of the new park's central attraction A Trip to the Moon, or after Dundy's sister. Luna Park was a vastly expanded attraction built partly on the grounds of Sea Lion Park, the first enclosed amusement park on Coney Island which closed down due to competition from near by Steeplechase Park. 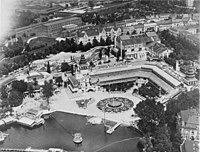 In 1905, Frederick Ingersoll, who was already making a reputation for his pioneering work in roller coaster construction and design (he also designed scenic railroad rides) borrowed the name when he opened Luna Park in Pittsburgh and Luna Park in Cleveland. These first two amusement parks, like their namesake, were covered with electric lighting (the former was adorned with 67,000 light bulbs; the latter, 50,000). Later, in 1907, Charles Looff opened another Luna Park in Seattle, Washington. Ultimately, Ingersoll opened 44 Luna Parks around the world, the first chain of amusement parks. For a short time, Ingersoll renamed his parks Ingersoll's Luna Park to distinguish them from the Luna Parks to which he had no connection. Ingersoll's death in 1927 and the closing of most of his Luna Parks did not stop new parks from taking the name. The Luna Park Tel Aviv currently operates in Israel. Night photograph of original Tsutentaku Tower overlooking Luna Park, Osaka in 1912. Luna Grand Park Haifa, Israel 2001 to 2013 Closed after five months due to poor attendance following a religious boycott and reopened after negotiations with the local religious community. Closed for good on October 31, 2013 to make room for a new cinema. Aerial view of Luna Park, Berlin in 1935. Postcard showing mountain railroad at Luna Park, Leipzig. Luna Park, Aidonakia Athens, Greece ? to present Constructed by Ingersoll. Also known as "Ta Aidonaka"
Luna Park, Moscow Moscow, Russia 1993 to present Officially called "Luna Park Carousel." Luna Park, Alexandria County Alexandria County (now Arlington County), Virginia, USA 1906 to 1915 Designed and built by Ingersoll. Some sources refer to it as Washington Luna Park or Luna Park, Washington, D.C.
Luna Park, Coney Island (opened 2010) New York City, USA 2010 to present Constructed on the site of the former Astroland (across the street from the original Luna Park). Luna Park, Honolulu Honolulu, USA Designed and built by Ingersoll. Luna Park, Mexico City Mexico City, Mexico 1906 to ? Designed by Ingersoll. On the same site as Luna Loca. Luna Park, San Jose San Jose, USA 1910 to 1916 Included a baseball stadium that served as home for the San Jose Prune Pickers and San Jose Bears of the California State League. Luna Park, Scranton Scranton, USA 1906 to 1916 Constructed by Ingersoll. Most of grounds now covered by Interstate 81. Luna Park, Seattle Seattle, USA 1907 to 1913 Designed by Looff. Luna Park, West Hartford West Hartford, USA 1906 to 1930 Name changed from White City just before the park's grand opening. Luna Park Glenelg Glenelg, South Australia 1930 to 1934 Closed due to objections of local populace to Sunday operations and expansion plans; moved to Milsons Point (1935) and became Luna Park Sydney. Luna Park Melbourne Melbourne, Victoria 1912 to present Designed and built by Ingersoll. Oldest operational Luna Park and famous for having the oldest continually operating roller coaster in the world. Luna Park Redcliffe Redcliffe, Queensland 1944 to 1966 Erected on an unused section of the foreshore just north of Sutton's Beach at Redcliffe Point in late 1944. Owners, Redcliffe Town Council appointed Messrs W. Scott and Philip Wirth as amusement managers. Later the enterprise was sold by the Redcliffe Town Council to local businessman Hal Buchanan who sold it on to the Roman Catholic Archdiocese of Brisbane, which sold it again in 1952. Amusements included a steam train, ferris wheel, sideshows and car-rides as well as a salt-water swimming pool. Luna Park Auckland Auckland, New Zealand 1926 to 1931 Established on Auckland's Waitemata Harbour, using rides and equipment from the New Zealand and South Seas Exhibition, a world fair that ran in Dunedin, New Zealand, from 1925–1926. Due to the depression, Luna Park began to run at a loss and was shut down in 1931. Luna Park, Buenos Aires Buenos Aires, Argentina 1934 to present Designed and built by Ingersoll. Became site of a sports arena built 1931–1934. As of 2013, it still runs, serving as a venue for stage concerts & presentations, both national and international, and as a sports arena. Acclaimed international shows such as Disney on Ice and the Harlem Globetrotters have performed in Argentinean Luna Park. It is known for its adaptability to host ice-skating rinks, multiple stages, sports courts, and others. Lunapark, Lecherias Lecherias, Anz., Venezuela Still Functioning. 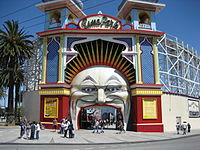 Wikimedia Commons has media related to Luna Park. ^ Coney Island's success with electronic attractions and rides also inspired a proliferation of parks named Electric Park (Samuelson, Samuelson, Yegoiants, The American Amusement Park). ^ "official site - Luna Grand Park". Archived from the original on 2017-12-24. Retrieved 2013-11-06. ^ "Luna Grand Park Official Website". Archived from the original on 2017-12-24. Retrieved 2013-11-06. ^ "одесский лунапарк, аттракционы". lunapark.odessa.ua (in Russian). Retrieved 2017-08-31. ^ (1) "Luna Park". Arlington Public Library: A Pictorial History of Arlington - Area H Neighborhoods. Government of Arlington County, Virginia. Archived from the original on April 1, 2010. ^ Reports of Cases Determined in the Appellate Courts of Illinois: Edwin C. Day vs. Luna Park Company and James O'Leary, Gen. No. 16,480 – Harvard Press, 1913: Ruling of an appeal of a case involving Luna Park, Chicago, and a concessionaire who declared bankruptcy in 1908. Case was filed in 1909, ruled and appealed in 1910, with the ruling of the appeal in 1912... the year after Luna Park itself was shut down. ^ "Connecticut History Online - Luna Park West Hartford". Archived from the original on 2011-07-24. Retrieved 2009-01-12. ^ "Picture of entrance - Connecticut History Online". Archived from the original on 2011-07-24. Retrieved 2009-01-12. ^ a b "A Time Line of All You Need to Know in Luna Park Sydney and Everything Else" (PDF). Archived from the original (PDF) on 2008-11-21. Retrieved 2009-01-12. ^ a b "REDCLIFFE LUNA PARK TAX FREE". The Courier-Mail (3437). Brisbane. 12 September 1944. p. 3. Retrieved 31 March 2017 – via National Library of Australia. ^ "Out Among The People : Wirth Of Circus Fame & Five Sisters In Show". The Advertiser. Adelaide. 10 July 1946. p. 10. Retrieved 31 March 2017 – via National Library of Australia. ^ "SHOWMAN SUED BY WIRTH". Brisbane Telegraph (CITY FINAL) ed.). 22 August 1949. p. 10. Retrieved 31 March 2017 – via National Library of Australia. ^ "NEW OWNERS FOR LUNA PR". Brisbane Telegraph. 15 May 1950. p. 10 (SECOND. Retrieved 31 March 2017 – via National Library of Australia. ^ "No Change Yet In Park Lease". Brisbane Telegraph (CITY FINAL ed.). 29 May 1950. p. 10. Retrieved 31 March 2017 – via National Library of Australia. ^ "BAY ALDERMAN WALKS OUT Amusements At Redcliffe Cause Clash". Brisbane Telegraph (CITY FINAL ed.). 19 June 1950. p. 11. Retrieved 31 March 2017 – via National Library of Australia. ^ "Riding the Surf At Scarborough". Sunday Times (Perth) (2179). Western Australia. 29 October 1939. p. 24. Retrieved 31 March 2017 – via National Library of Australia. ^ "LUNA PARK OPENED". The West Australian. 55 (16, 662). Western Australia. 27 November 1939. p. 7. Retrieved 31 March 2017 – via National Library of Australia. ^ "SCARBOROUGH'S LUNA PARK". Sunday Times (Perth) (2183). Western Australia. 26 November 1939. p. 12. Retrieved 31 March 2017 – via National Library of Australia. 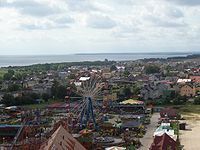 ^ "Patriotic Funds: WILL BENEFIT FROM LUNA PARK OPENING". The Mirror. 17 (909). Western Australia. 18 November 1939. p. 9. Retrieved 31 March 2017 – via National Library of Australia.